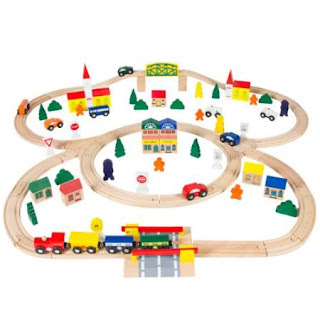 Right now over at Walmart you can score this 100 Piece Hand-Crafted Wooden Train Set for just $34.94 shipped (Retail $89.99). This 100-piece train set is complete with railway tracks (triple loop design), bridges, buildings, traffic signs, magnetized train engines, city vehicles, trees, and pedestrian figures. AND it is 100% compatible with major brands like Thomas Wooden and Brio Railway System making it easy to create a larger railway system or city.